Highly celebrated for her Harry Potter novel series, author J.K. Rowling made her “adult” debut in 2012 with The Casual Vacancy. Sarah Phelps adapted it for a TV miniseries, a joint production between the BBC and HBO. Phelps is known for her work as a writer on the British soap EastEnders, and it shows in this ensemble piece. Though it boasts a varied cast, all of whom step up with well-drawn performances, the main problem with Vacancy is that it crams too much into three one-hour episodes. I’ve not read Rowling’s novel, but it feels as if there’s enough material here for about ten episodes. Characters, however intriguing, are given short shrift right and left simply because of time constraints. Basically, Phelps and series director Jonny Campbell throw a bunch of characters at us and let us glimpse their day-to-day lives. They’re all residents of Pagford, a small English village. When the local parish councilman (Rory Kinnear) suddenly, unexpectedly dies of an aneurysm, the townsfolk are thrown into a tizzy. As candidates rush to fill the void, we meet a variety of sometimes unsavory types. The brother of the deceased thinks he’s a shoo-in due to the familiar relation, but he’s a bully who no one likes. It’s hard to keep all the characters straight and, worst of all, there’s little reason to care about any of these people. Krystal (Abigail Lawrie) is a rare exception, a troubled teen dealing with a substance-abusing mother. She struggles to provide some stability for her young brother. Lawrie is effective, but her character feels ripped right out of the film Fish Tank. Not only does newcomer Lawrie look like Katie Jarvis, the character feels very similar. The Casual Vacancy boasts strong production values, but they’re propping up a plot that is simply not compelling. There are too many characters for three hour-long episodes. The whole crux of the story centers on a community center that apparently provides services for the poor. Whoever gets elected to the council will be the deciding factor in whether or not these services continue. If not, it will become a country club for the rich. Perhaps the socio-political nuances play better in the UK. In fact, I believe Vacancy will prove to be an exceptionally hard sell for US audiences. If you arrive solely because you’re a fan of Rowling’s Potter series, you’re in for a very bitter disappointment. The Casual Vacancy is presented in 1080p high definition with a DTS-HD MA 5.1 surround mix. 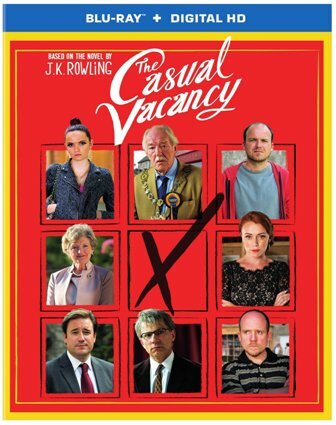 Extras include a trio of short featurettes: “An Introduction to The Casual Vacancy,” “Adapting The Casual Vacancy,” and “Casting The Casual Vacancy.” The Blu-ray package also includes a downloadable Digital HD Copy.